The third State of the Nation Address (Sona) of President Benigno “Noynoy” Aquino III lasted 1 hour and 39 minutes. It was his longest Sona so far. But the 8,890-word speech never made reference to the perennial problem of consumers – the ever rising costs of electricity, petroleum, water and other basic goods and services. In fact, the issue of high prices and what his administration plans to do to address it has never been a topic in Aquino’s annual Sona. The non-mention of the problem of high prices was made more conspicuous by the almost simultaneous increases in electricity rates, water rates and oil prices just days before the Sona. 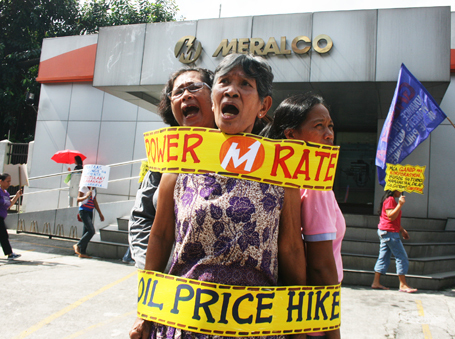 The Manila Electric Co. (Meralco), the country’s largest power distributor, hiked its distribution charge by 29.1 centavos per kilowatt-hour (kWh) and its generation charge by 32 centavos; private water concessionaires Manila Water Co. and Maynilad Water Services Inc. increased their rates by 39 centavos and 89 centavos per cubic meter, respectively. Oil companies, meanwhile, have increased the pump price of unleaded gasoline by ₱4.35 per liter and diesel by ₱3.10 after three straight weeks of price hikes this month, including the latest round hours after Sona. Costs have been unjustly increasing since long ago due to programs initiated by Aquino’s predecessors, namely the deregulation of the oil industry in 1996-1998 and the privatization of the Metropolitan Waterworks and Sewerage System (MWSS) in 1997 under former Pres. Fidel Ramos, and the privatization of the National Power Corp. (Napocor) in 2001 under Mrs. Gloria Arroyo. However, Aquino is still accountable for continuing these programs and not even bothering to at least review them despite their harmful impact on consumers. In fact, the President even made these programs the centerpiece of his development plan such as the public-private partnership (PPP) scheme. And if you were wondering why the triple whammy of power, water and oil price hikes did not merit even a single sentence in Aquino’s Sona, or why addressing the issue of high prices has never been an agenda of the President, for that matter, this previous post might help enlighten you. Indeed, the families running the country’s largest utilities and burdening the consumers with exorbitant prices are among the closest allies and long-time cronies of the Aquino clan. Petron, the biggest oil firm in the Philippines, is majority-owned by San Miguel Corp. (SMC) of Aquino’s maternal uncle Eduardo “Danding” Cojuangco Jr. while the Ayalas are connected with Pilipinas Shell; Meralco is controlled by SMC, the Lopezes and Manny V. Pangilinan’s group; and Manila Water is controlled by the Ayalas while Maynilad is co-owned by Pangilinan and the Consunjis. Aquino’s longest Sona yet mentioned many indicators to highlight the supposedly improving economy such as credit rating upgrade, stock exchange performance, and growth in the gross domestic product (GDP), among others. But these indicators are not only abstract for the ordinary folks; they also do not mean increased economic opportunities. They are, however, indicators of how big business is enjoying a favorable environment under Aquino, reaping whatever little wealth is being squeezed from the pre-industrial economy. Meanwhile, the issues that matter to us such as how Meralco, Petron, Shell Maynilad, Manila Water and other big companies owned by Aquino’s super-rich relatives and friends are oppressing us with skyrocketing prices and rates were left unarticulated by the landlord President.